Moving Meadows Farm is owned and operated by Wally and Amy Hudson. We produce high quality, nutrient dense food on 47 acres in Culpeper, VA.
Our journey to the farm began over 10 years ago while living in Alexandria, VA. Back then, we had a desire to grow wholesome fresh fruit & vegetables and market them directly to consumers. As our family grew, and we had more mouths to feed, we began to transform our small suburban yard into a wonder of edible landscaping; our desire to move to the country grew with the passage of time. 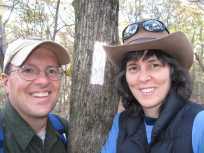 Looking for land in Fairfax County, we wanted to stay close to the area. I'll never forget the day when Wally began his journey as our general contractor and we broke ground... It was August 25, 2004. I looked at my husband and said, "Honey, four months from today is Christmas, where are we going to put our Christmas tree?" "Here, I hope!" was his answer. Well, we watched with eagerness as the excavator dug the hole; the concrete trucks came, pouring the foundation after the forms were in place. Soon after that, the framers arrived, and the roofer got busy and time ticked by. The windows and doors in, the interior work began... and time ticked by. If you have ever taken upon yourself this task of building a house, you know that everything takes such time!!! One year after we broke ground, almost to the day.. August 23, 2005, Hurricane Katrina hit the Gulf Coast. Another story for another time, but just let me tell you that with the rebuilding efforts of Katrina, and the rebuilding after the Iraq war... building material prices skyrocketed! Also, the company Wally worked for was struggling, so he took pay cuts. Therefore, we had to take over with the building of our dream home. (contractors move over, here we came, *sigh*) We were only able to work nights and weekends, as Wally continued on in his day job. Late summer, 2005 I asked again... "Where are we to put our Christmas tree?!" Another year... more work. Fall 2006... "Honey where are we gonna to put our tree?" We worked hard. Our four beautiful children worked hard with us. Our youngest learned to sleep well thru hammers, saws and power screw drivers as we finally began to hang drywall. As Wally worked his day job... we still continued to build the house... evenings and weekends. God continually blessed us and brought strength through much help from dear friends who also desired to see us living in our dream home. Things got interesting when in February 2008, the children and I were involved in a terrible car accident. The Suburban had a blow out, and we ended up slamming into an embankment and crashing into trees after spinning around a bunch of times. Our oldest son was pinned in the car for 90 minutes. We are thankful for life today... as we are all fine now. You can imagine... this threw a monkey wrench into our building plans. But as soon as we could, we got back to work with the help from dear friends who helped us push to the end. I won't ever forget that cell phone call from Wally. He said something like, "Let's get moving!" I knew we had passed inspection and had the occupancy permit! It was a beautiful day... April 1, 2008 we moved in. And what a DELIGHT it was! Over and over again, while we were building our home, my gaze would fall upon those mountains and I would ponder the verses quoted in the Sound of Music as the family escaped into the mountains: "I will lift up my eyes to the mountains. Where does my help come? My help comes from the Lord, Maker of heaven and earth." (Ps. 121) And now, here I was... living where I could view mountains daily, remembering that yes... my help has been/is from the Maker of heaven and earth, and that one day I will stand before Him... ready! Are you ready? Right now, our fencing project is in full swing with hopes of putting more cows on the land. We had two baby goats born here a few weeks ago. We have meat chickens on pasture right now, moved daily that should be ready early December. The final batch is on pasture now, so we will have them into the winter... available while supply lasts. Well, thanks for "listening" and for taking an interest in our farm. Come see us at TASTE in downtown Culpeper (202 East Davis Street!) 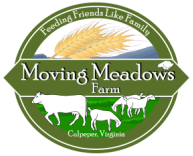 starting Dec. 3rd and introduce yourself... New friends become good ole friends real fast with us here at Moving Meadows Farm! We have grass fed gourmet goat available, along with a fresh batch of chickens in the freezers. (Chickens ranging from 3.5-6 pounds available.) Farm sales welcome or you can find us at the Culpeper Farmers' Market. By August we hope to be selling farm fresh eggs. GOAT meat didn't last long... we are sold out. Our first calf has been born here on the farm! Goat kids are arriving as well. Culpeper Farmers' Market opens Saturday April 27th. Goat meat and beef will be along in May we hope. BEEF is here! And oh my, how yummy! When Wally brought it home, I immediately thawed a pound of ground, and made hamburgers. The smell of them cooking caused me to stop and hover... and enjoy even the smell of them cooking!! Oh MY were those burgers delicious!!! And then we tried out the rib-eye... and then the sirloin, and then the filet, and then a roast... all SO yummy!!! We have never tasted such yummy beef before now. We like to remind folks of the "Flavor Rule,"... FLAVOR RULES!!! :-) See ya at the market until November 23rd!!! It's been too long since our last update... sorry about that! The best way to keep up with our doings is to follow our Facebook page. There you will see daily updates on how we are very busy with our downtown store, now turned bakery! We mill our own flour in our beautiful Austrian mill and then immediately turn it into bread! Come try our whole grain breads & goodies!